When I was 18 I visited the Liberace Museum in Las Vegas (now sadly no longer open, but you can see what it looked like here). Never before or since have I witnessed such an insanely glorious, exuberantly flamboyant and unashamedly kitsch shrine to OTT bad taste. Steven Soderbergh's Behind the Candelabra strips away the riotous excess, the rhinestone-encrusted furs, mirror-inlaid grand pianos and silver limousines, to reveal, er, well, more kitsch extravagance, of course. But it also uncovers a sad story of a lonely, rich, old man who thinks he can buy happiness and discovers he can't. Based on the autobiographical book of the same name, the film tells the story of Scott Thorson (the book's author), a strapping young farmboy with a lonely upbringing who becomes the famous piano-playing showman's confidante, lover, best friend, adopted son and, finally, confessor. Quickly transformed from good-natured, innocent jock, overawed by the splendour of his new sugar daddy's opulent lifestyle, to spoilt, self-indulgent lapdog to shiny-faced, nip'n'tucked petulant drug addict, Thorson learns the hard way what it's like to love and lose the world's most infamous closeted queen. 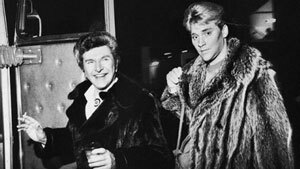 Behind the Candelabra could so easily have descended into a big ol' camp farce with period dressing, a made-for-TV kiss'n'tell luridly poking fun at a delusional, lecherous May to December romance with added celebrity pizzazz. But in the expert hands of Steven Soderbergh, yes, it's camp – how could it be otherwise, given the subject matter? – and it's outrageous, funny, exaggerated, sometimes shocking and occasionally grotesque, but it's also insightful and moving, a finely-honed portrait of an affair that goes sadly awry, an exasperating yet touching study of narcissism, selfishness, co-dependence and fear of ageing. Michael Douglas and Matt Damon are simply superb as the aged roué and his young Adonis. Both are pushed so far out of their acting comfort zones they're almost unrecognisable – so much so that you more or less forget who they are and see only their characters. I'm not the first to lament the fact that, as the film hasn't had a theatrical release in the States, Michael Douglas won't be eligible for an Oscar nomination, as otherwise he'd be a shoe-in – as would the make-up department, who do an incredible job of transforming the two leads through facelifts, nose jobs, skin tucks and of course the inevitable, inerasable ravages of a dissipated lifestyle. Speaking of nose jobs, special mention must be made of Rob Lowe's scene-stealing cameo as gungho, pill-peddling plastic surgeon Dr Jack Startz. With his super-stretched, Teflon face, slitted eyes and slot of an immobile mouth, he's a walking warning against his trade. 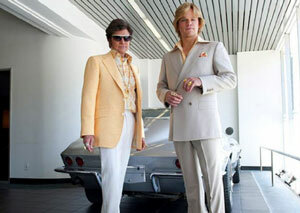 Part lavish musical biopic, part beautifully styled kit(s)chen sink drama, part Great Gatsby-style paean to excess and the perils thereof, part inevitably sorry love story, Behind the Candelabra has all the ingredients I love in a movie, and it mixes them together perfectly to create a diamond-studded, boogie-woogie Vegas epic that's as superficially glamorous and deep-down sad as its heroes. 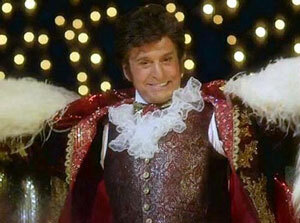 Would Liberace have liked this film? Probably not – but he'd have loved its style.